You may have heard I've entered a Blog Makeover Contest being sponsored by my good buds at Tribal Blogs. You haven't heard? Well I have...entered the contest. And of course I've heard. I'm in the contest, eh. And you know what? I need your vote. So think carefully when you cast your vote here: cheese with holes, something fishy, or steak...or tofu...that sizzles (me!)? This ad is paid for by the committee to elect nonamedufus as the winner of the Tribal Blogs Blog Makeover Contest. Any slanderous comparisons of other participants is purely intended. "I'm nonamedufus and I approve this sizzle." AND when I tried to vote for YOU more than once? It wouldn't let me! And I like mine well done. Now you're just being shameless. But if I vote for you, will you send me some nicely aged steaks, about 1-1/4 inches thick? 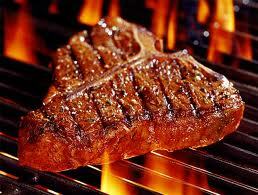 T-bones are good, but I prefer rib steaks (I don't suppose there's a Nortown in Aylmer?). Don't get me wrong, we do get beef here, it's just not very good. 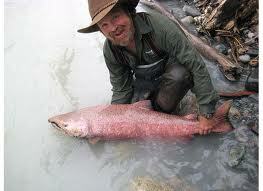 I'd also settle for a nice salmon or some nice rainbow trout. I can see this buying votes thing is going to be expensive. Oh, it's like that, is it? 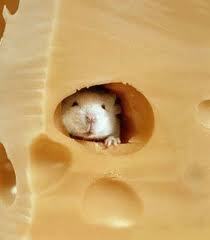 Mouse-ravaged stinky cheese, indeed!! The gloves are off, sir! HEY!! What happened to the "I love both blogs and couln't possibly choose between you."?! We're very disappointed in you Dozo. Mike is actually crying. Yes, crying. It's not pretty. I only used it for comparison's sake. I meant no slight against you, my esteemed competitor. Oh, I'm going to hell for that one. She obviously likes a good steak over a stinky cheese. Okay, okay. I'll vote for both blogs but, like I said, my votes would be kinda redundant. I can't pick sides. I'm Switzerland (yet I still can't speak French worth a hill of les haircuts). Yes. Yes, you are. I hope you're happy. Hurry up! Im ready to" PPP"- poot, piss and pun! Patience, patience. Go and vote for me first. The competition is pretty fierce with this. Cheese, fish or steak? Where's the mushrooms? Oh, didn't I tell you? They're included with the steak! And for you, Linda, no charge. Thank you! And really, you just can't beat Dufus's meat! Well, actually I might be open to offers. Oh but if you choose cheese you get an awesome little pet that will crap everywhere. Exactly! Hey, are you supposed to be over here in the midst of this hotly contested, um, contest?